Visiting Iceland was one of our biggest dreams. Once we actually started planning our trip, we decided we want to spend enough time there to explore it thoroughly. In general, that’s an unreachable goal. 😀 So we made it a bit more specific: we wanted to spend some time in all the regions of Iceland and we wanted to have time for some full day hikes. We ended up spending almost three weeks (18 days) in Iceland and it was one of our favorite trips ever! We’ve already shared some of our travel itineraries on the blog and you guys seem to find them useful. That’s why we decided to share our Iceland itinerary, as well, but in two parts. First of all, because it would be ridiculously long. On the other hand, the region where we spent the longest time is Southern Iceland with 7 days. Since it’s close enough to the country’s only international airport and it offers diverse and wonderful natural beauties, we’d recommend exploring the South if you come to visit for only about a week or less. Southern Iceland is the most densely populated region and and it’s easy to access all year round. There’s no need to worry about gas stations or supermarkets, they will be on your way quite often. The main roads are all paved, we rarely had to drive on gravel roads in Southern Iceland – and even those sections were quite short. It gives easy access to some of the most famous sights in the country – like Jökulsárlón, Seljalandsfoss, Skógafoss or Black Sand Beach. Of course, there’s a price to pay. It’s the busiest region due to the exact same reasons I’ve just mentioned. It was the only region where we were always surrounded by a bunch of other tourists wherever we went. In that sense, it can give you a misleading impression of Iceland and it’s not the place to find lonely roads where you won’t meet anyone else all day. But it’s a breathtakingly beautiful region! We like itineraries because they help us not to miss the sights that we think are important. But there’s no perfect itinerary and it applies even more to itineraries that are 100% outdoors. Sometimes we had to change our perfectly crafted plans because of a sudden storm. That’s another reason we were happy to have 7 days in the South. 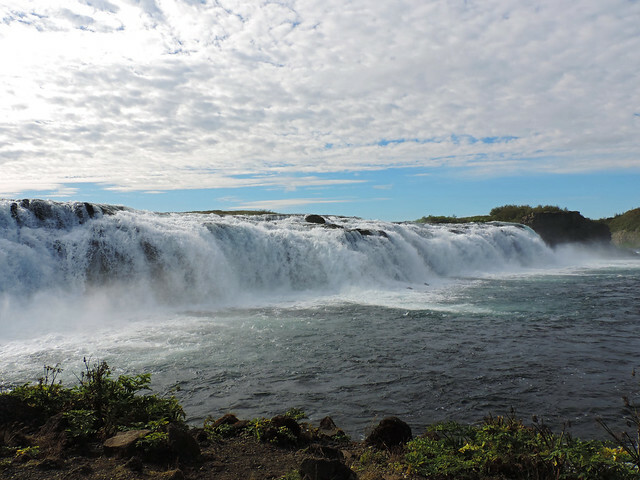 The Golden Circle is a short and pretty scenic drive and it’s one of the most popular programs for anyone visiting Iceland. 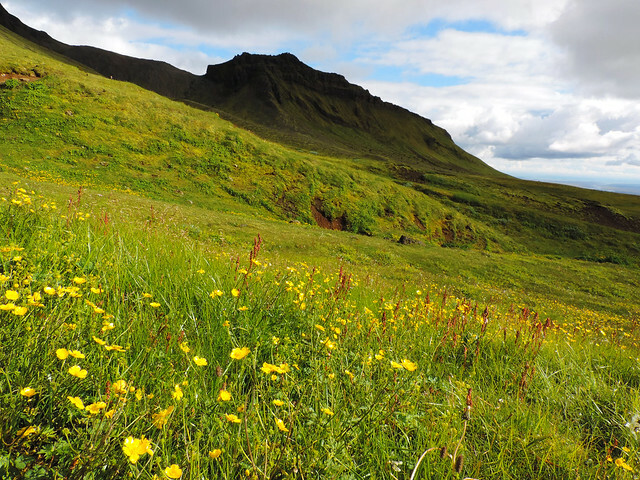 It takes about 1.5 hours to drive there from Keflavík Airport and it offers various kind of natural beauties that make Iceland special. Read more about our extended Golden Circle scenic drive here! 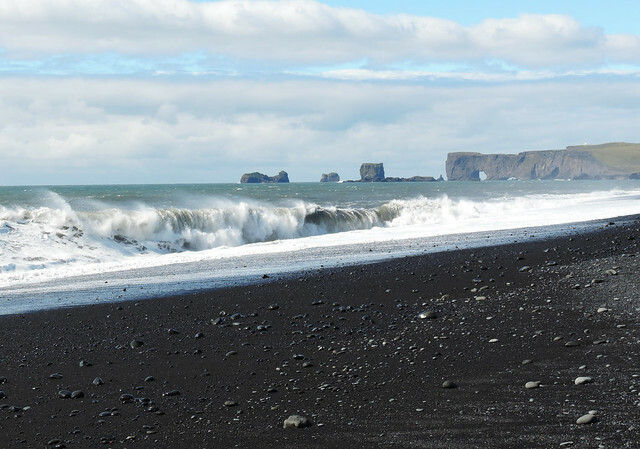 We started the day early in the morning at Reynisfjara, the famous Black Sand Beach. 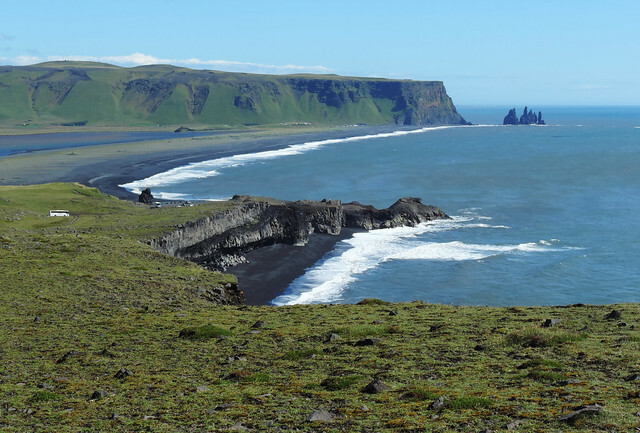 Though there are a lot of black sand beaches in Iceland, this is the most well-known and the most spectacular. It amazed us with huge waves, amazing basalt formations and a basalt cave. 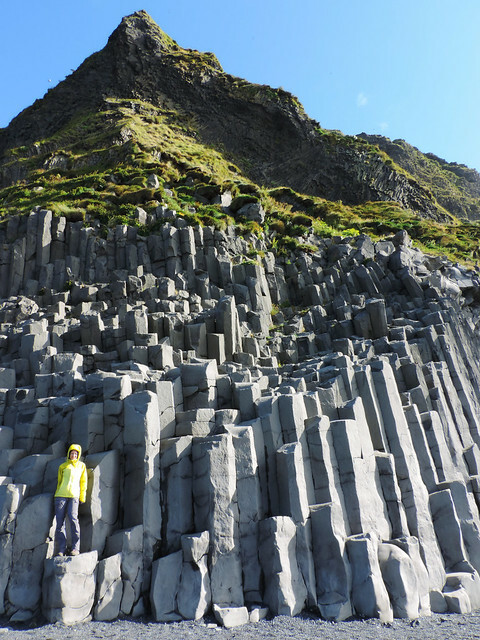 One or two hours easily flied as we walked on Reynisfjara. 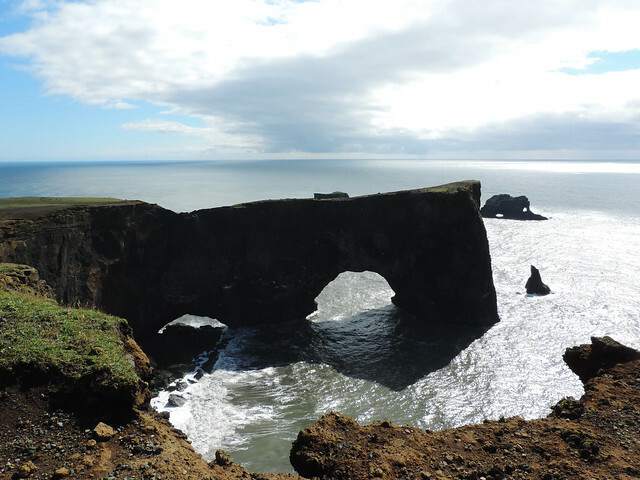 Then we drove up to Dyrhólaey lighthouse where we had wonderful views of Reynisfjara and the coastline from above. The loop walk around the lighthouse is easy, very scenic and very windy. By noon we arrived to Skógafoss that welcomed us with a rainbow. This 60 meters tall and very powerful waterfall is one of the most iconic ones in the country. And this is also the trailhead of popular Fimmvörðuháls trail. So we climbed the stairs to the top to see Skógafoss from above and to start our hike in the Skógar Valley. We were a little bit late (just a little bit, like 2 hours 😀 ), still we thought we will do the first section of Fimmvörðuháls. It was pure joy. We just kept going and exploring waterfall after waterfall… There were twenty-something of them along the way. We ended up doing only about the first 5 kilometres of Fimmvörðuháls (and then back), but it took more than 8 hours. Even the long Icelandic summer day was closing to its end when we arrived back to Skógafoss. But it was one of our favorite days. The next day it was time to take a lesser known road. 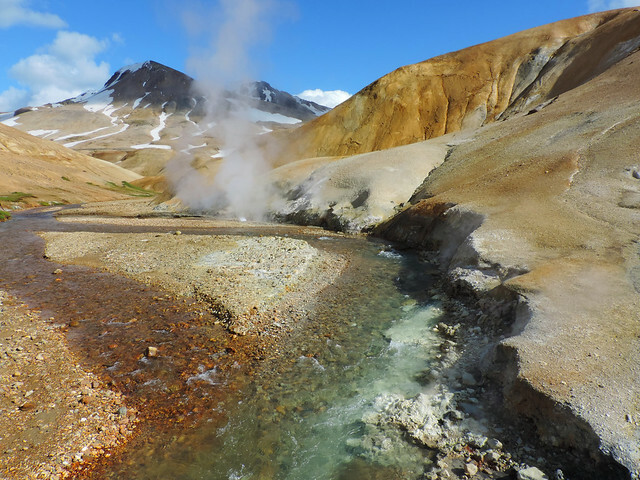 Our destination was the natural geothermal hot springs of Landmannalaugar in the Icelandic Highlands. On the way there we planned to stop for a short hike at Sigöldugljúfur Canyon. An adventurous day ahead. We’ve actually already written a full blog post about this day – read it here! But just one day was not enough in the Highlands. Two neither… still our second day was just as wonderful as the first one. We planned some shorter hikes in the Kerlingarfjöll Mountains. It was a completely different route than the one we explored towards Landmannalaugar the day before. First, we drove to Gullfoss, then followed F35 that starts just past the parking lot at Gullfoss and heads towards Ásgarður campground. Again, the landscape became so different – sometimes deserted, sometimes so colorful – that we felt like leaving planet Earth. We drove to the junction with F347 and turned there. It was only a short drive on a very steep, bumpy and rocky road from the junction to the parking lot of our first trail to Snækollur peak. We already had jawdropping views from that small dirt parking lot. Then we climbed to the peak of Mount Snækollur (1460 m) that was covered by snow even in August. It was a steep, short, windy and beautiful trail that we enjoyed very much all the way. After we got back, the parade of colors continued on the nearby trails of Hveradalir geothermal area. The vivid orange hills were steaming (in reality, there are steaming vents under the ground), but the higher areas were still under snow. There are several loop trails that let us explore the area safely and we tried all of them that weren’t hidden under snow. 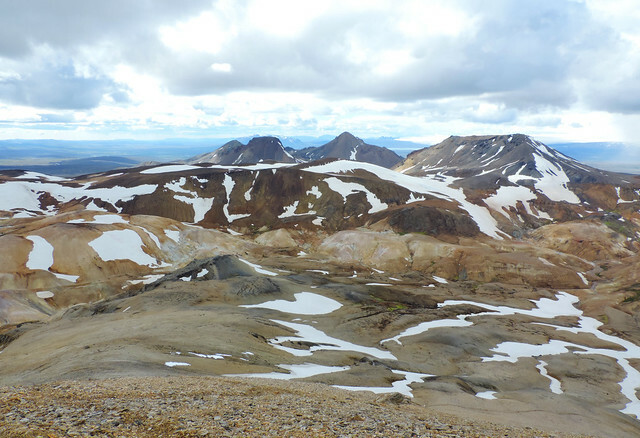 The landscapes we enjoyed in the Kerlingarfjöll Mountains all day were the most colorful ones we’ve ever seen. We’ve never even dreamed of this feast of vivid colors – but nature, as always, surprised us this time, as well. After two days in the Highlands we were back on the Ring Road. We started the day at Seljalandsfoss, another famous waterfall of the South. This 60 meters high beauty is one of those few waterfalls that you can walk behind. Be prepared to get amazed and soaked! 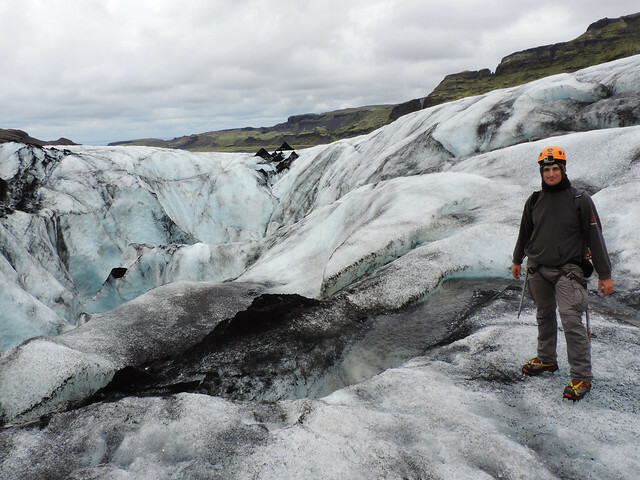 We had a glacier trekking and ice climbing tour to catch at Sólheimajökull from noon. 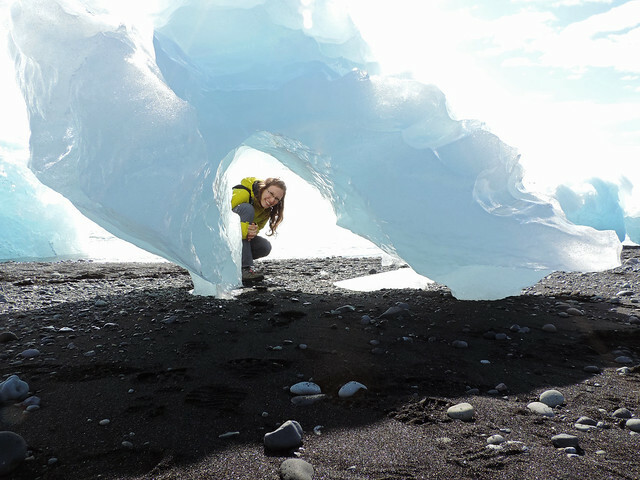 We haven’t ever walked on a glacier before and we were very excited to experience that in Iceland! Though we usually prefer hiking individually, this time we joined a guided group tour. 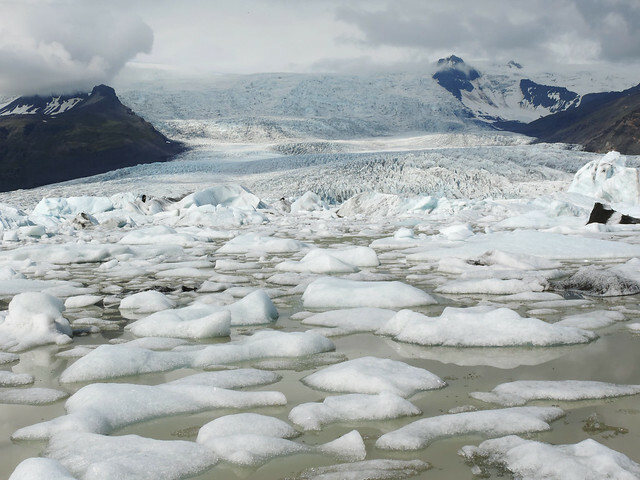 There’s just no way to walk on a glacier safely if you’re not a trained professional (and probably you don’t have the appropriate equipments either). It was fun exploring Sólheimajökull in a small group with our two friendly guides who also educated us about glaciers and gave us an introductory lesson in ice climbing. This was definitely not our last time on a glacier – at least, we hope so. Our tour lasted until about 5 pm and then it was time to head East towards Skaftafell and Jökulsárlón. 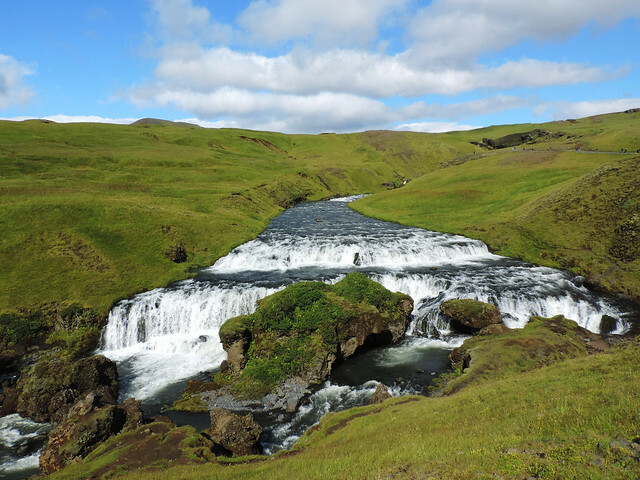 We regularly stopped for pretty waterfalls and pretty views, but there was one stop we were looking forward to very much: the short hike in Fjaðrárgljúfur Canyon. 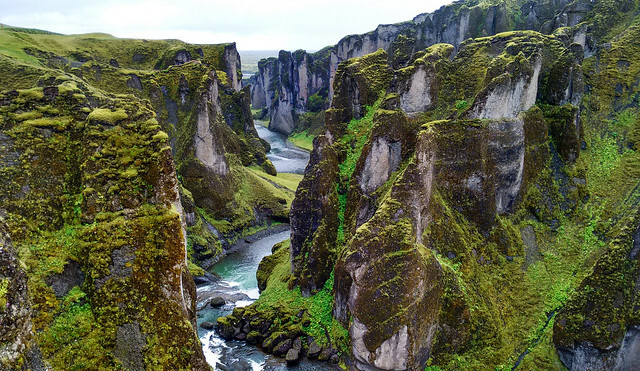 This picturesque canyon is just a short detour from the Ring Road and there’s a well-established trail and several viewing platforms along the edge of the canyon. However the rain arrived at the same time as we did and it was pouring for a while. The 100 meters deep lush green canyon and its waterfalls were still stunning though. 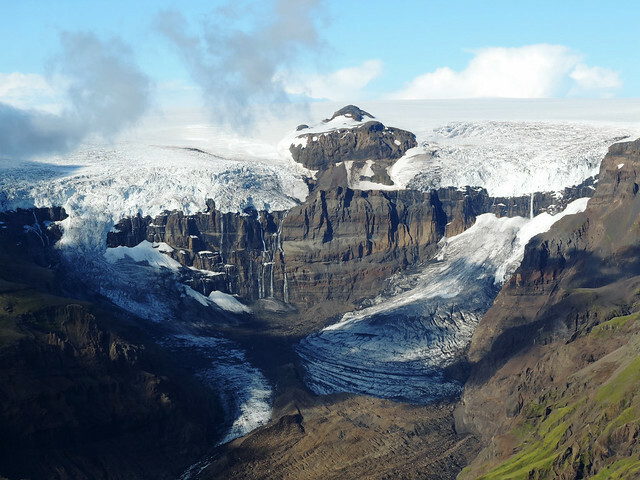 The following day was a full day hike in the Skaftafell area of Vatnajökull National Park. It’s a dramatic landscape with glaciers and snow-capped peaks and we could only encourage you to choose a trail that suits you and explore. Our choice was challenging: Kristínartindar peak – a strenuous, fabulous day hike that’s only open in the summer. Read more about the details of this hike here! 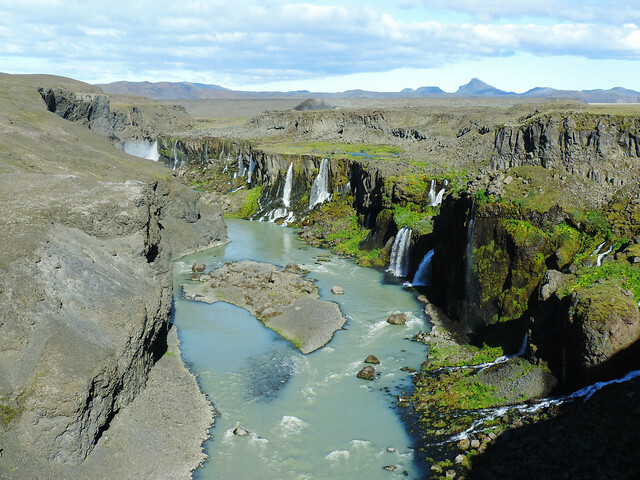 If you are looking for something shorter and easier, the loop trail to Svartifoss might be for you. 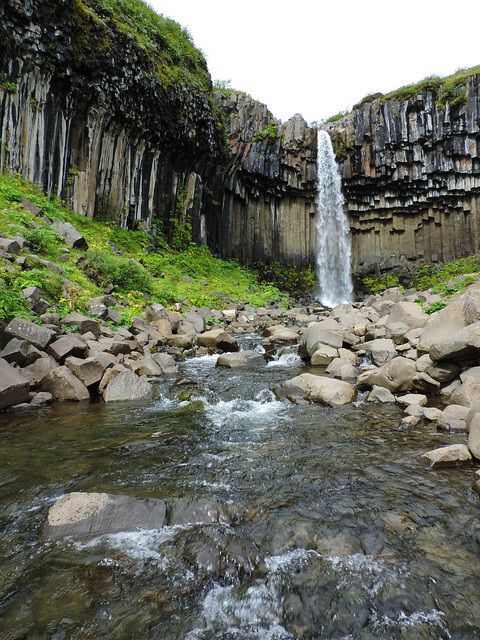 Svartifoss with its black basalt rock formations is said to inspire Hallgrímskirkja, the famous church of Reykjavík. 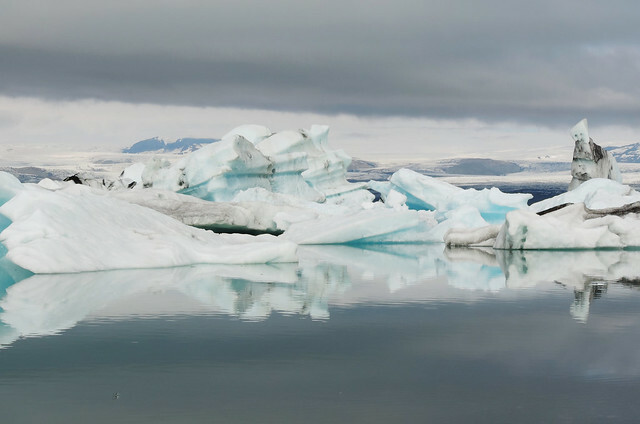 One of the most iconic sights in Iceland is baby blue Jökulsárlón Glacier Lagoon. There we could see how it looks when the glacier meets the ocean. Stunning! There are two parking lots on the two sides of the lagoon and the third one is at Diamond Beach. We stopped at all of them because we wanted to see (and photograph, of course!) this wonder from every angle. 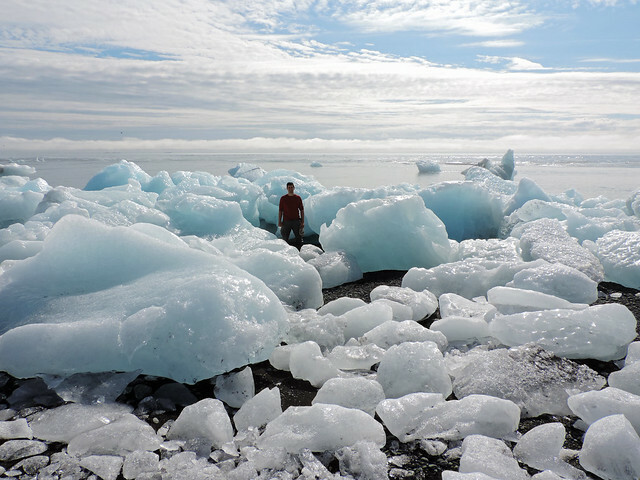 We spent several hours walking on the shore of the huge lagoon and playing with ice at Diamond Beach. Diamond Beach is where the lagoon flows into the ocean and the currents wash a lot of ice to the shore. They sparkle as diamonds in the sunshine. 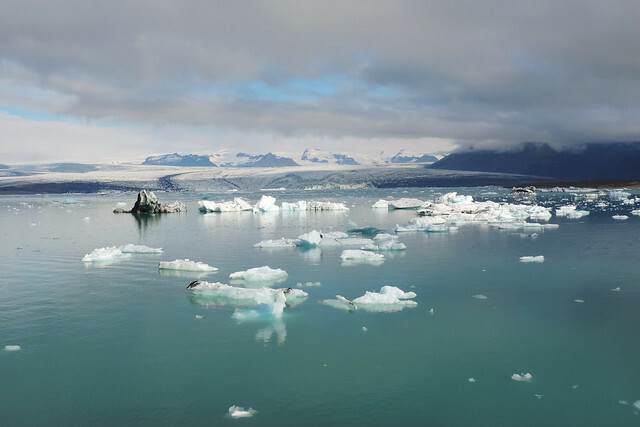 Fjallsárlón is another glacier lagoon that’s lesser known and smaller than Jökulsárlón. Its parking lot is just 10 minutes drive from Jökulsárlón and we enjoyed our time there just as much. 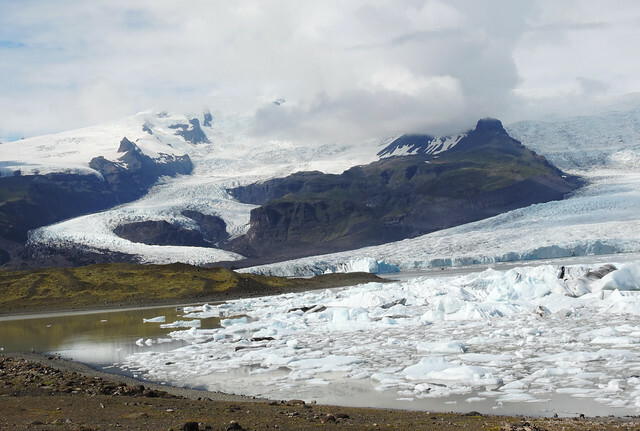 The water of Fjallsárlón is not that incredibly blue, it’s rather muddy, but the glacier itself is much closer to you than at Jökulsárlón. The high mountain peaks are also closer so the lagoon reflects them as a mirror in calm weather. The biggest town in Southern Iceland is Selfoss and that’s where we stayed for the most part of our explorations in the South. Höfn is closer to Skaftafell and Jökulsárlón though and it’s especially convenient to stay there if you continue your road trip towards Eastern Iceland. 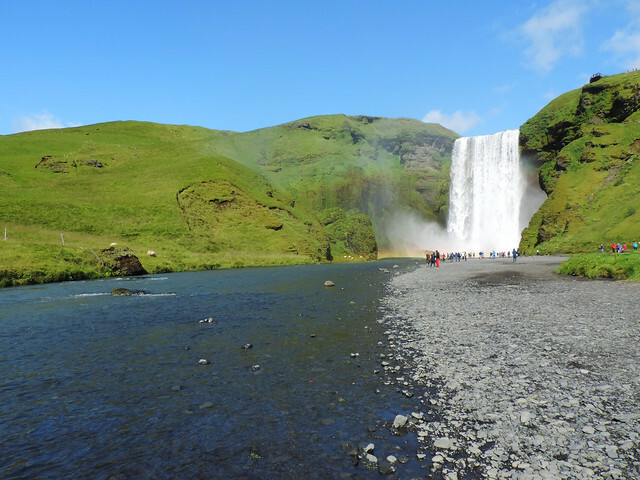 There are large campgrounds both at Skaftafell and Skógafoss. If you plan to book a room, our best advice is to book it as early as possible! 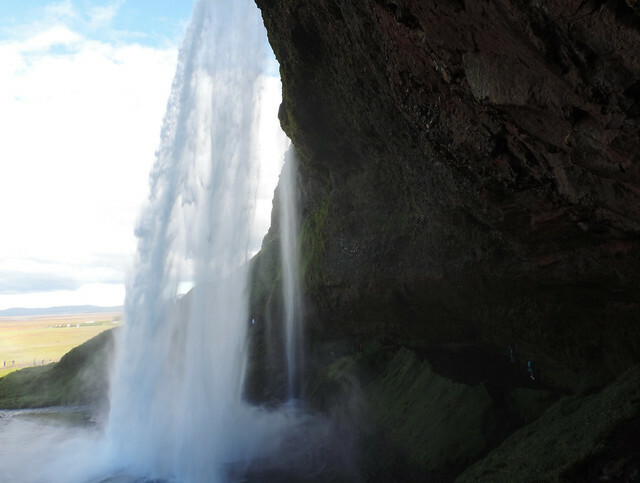 The number of tourists visiting Iceland have been rapidly increasing in the recent years – especially in summer. We booked our accommodation for July and August in January and February and we can tell you it was not too early. 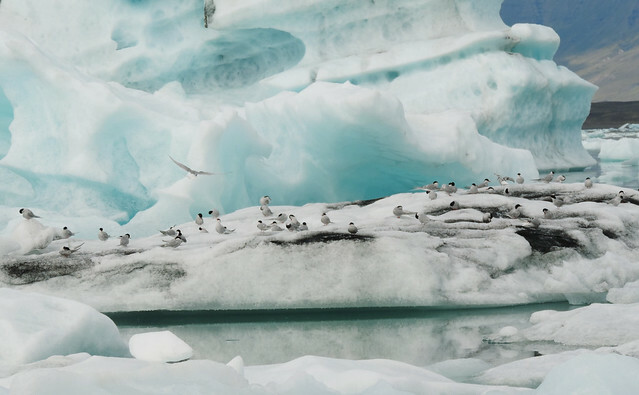 Our last note to this long, detailed list of sights is that whatever places you end up visiting, Iceland will amaze you. There’s no way of seeing everything, because every inch of this country is crazy amazing. So here’s to a wonderful visit! 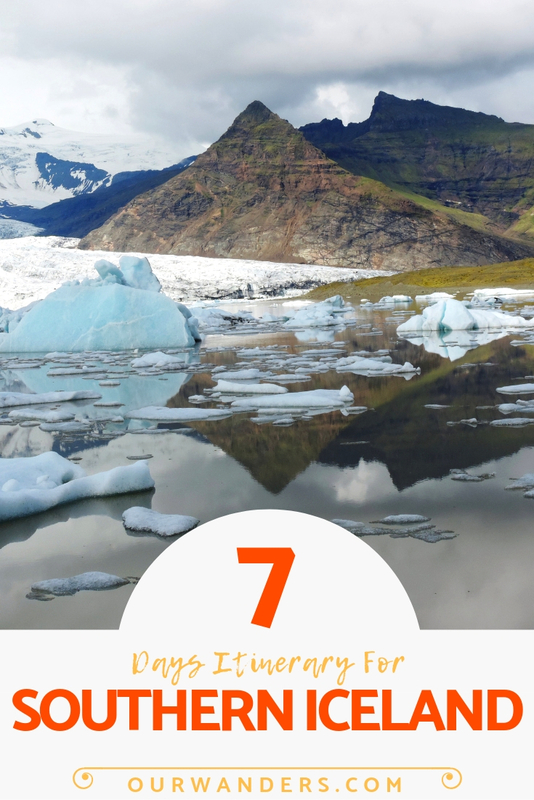 Are you planning to visit Iceland? Which sights are you the most excited about?